After you have an optimized feed, proper bid segmentation is the next essential step to performing well in search marketing campaigns. Great bid segmentation structures not only helps you to organize your bids, but also allows you to focus on critical product groups, and to optimize ad spend accordingly. When used deliberately and intentionally, Custom Labels are critical in driving great return on your ad spend. 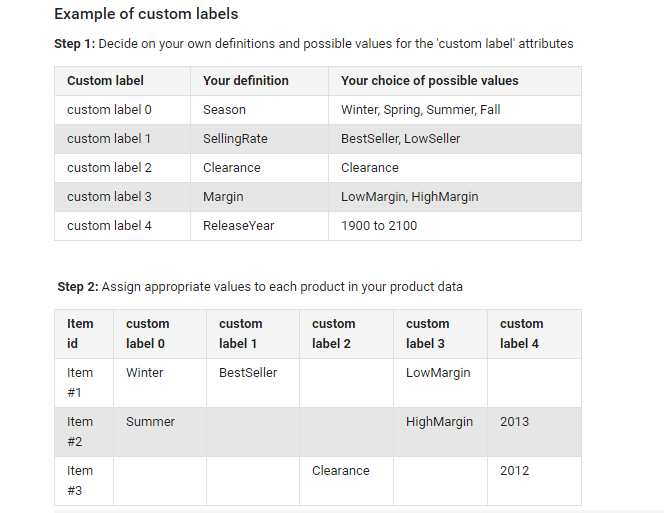 We’ve come up with 5 powerful ways to segment your bids using custom labels for improved performance on Google Shopping. Price Points, or price buckets, are a commonly used data point for powerful custom labels. Price Buckets allow you to separate your products by their price range. For example, a product that costs $12.99 could fall into the price range ‘$0-$50′. This label can be especially useful when there are large variations in prices within a single brand or product type. While it may appear optimal at times to raise bids on a particular brand or a specific product type group, doing so across the board could be wasteful. By raising all bids based on product type or brand alone, you risk bidding high for low-value conversions that will not justify their cost. Instead, by utilizing price points in clever ways within your segmentation, you can assign bids based on the potential conversion values of the products, optimize ad spend, and keep your other KPI’s on track! Feedonomics allows you to easily create price bucket custom labels. As a general statement, the Law of the Vital Few states that 80% of the results can be attributed to 20% of the causes. Applied to eCommerce, this means 80% of revenue on sales come from approximately 20% of products. Finding this magical 20% is far from magical, it can be done with performance custom labels! Typically, one can decide on cut-offs for poor/good/best performers based off of Adwords metrics, create a list and tediously label each one of these manually. With Feedonomics, we offer an all-in-one vertically integrated process and also automate it so that it becomes a dynamic solution that adjusts with new data. Our FeedSPI™ technology allows you to create custom labels based on how competitors are pricing their products on their websites, and even on Amazon. If you know that you have the cheapest product, you might want to increase your bids because there is a higher likelihood that you well convert better. On the other hand, if your product is more expensive than the competition’s you might want to lower your bids. Because Feedonomics allows you to join data from multiple sources into one master feed, you can easily bring in profitability data on a per-sku level into your feed! This means you can create rules for profitability custom labels. If you know a product has a bigger profit margin, you can create a custom label to increase your bids. Another great custom label is for-sale items. By tagging items as on sale, you can increase the bids, as these items are far more likely to convert with a price discount. This come in handy for sale days like Memorial Day, Black Friday, and Cyber Monday.